At Ascension Providence, we commit ourselves to serving all persons with diabetes by providing quality, comprehensive diabetes care. Ascension Medical Group Providence Endocrinology Clinic provides advanced medical care and education by professionals who are experts in diabetes. Our mission is supported through a diabetic self-care program that is easily accessible, promotes knowledge, behavioral changes and skills necessary for lifestyle alteration. Our goal is to empower people with diabetes and their families to become informed and remain current with diabetes management skills in order to promote health and prevent complications. We are also dedicated to being a diabetes educational resource in the heart of Central Texas. gram by the American Association of Diabetes Educators (AADE), a nationally accredited organization (NAO) certified by the Centers for Medicare & Medicaid Services (CMS). This allows people with diabetes in and around Waco increased access to high-quality diabetes education services. Diabetes education is a collaborative process through which people with or at risk for diabetes gain the knowledge and skills needed to modify behavior and successfully self-manage the disease and its related conditions. 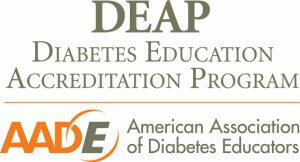 The program is comprehensive and taught by diabetes educators.